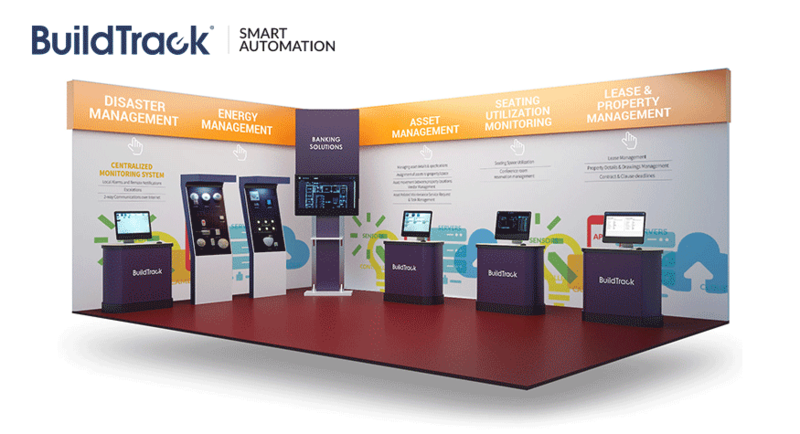 BuildTrack recently shared its Smart Automation technologies at IBEX 2017, the International Banking Technology Exhibition in Mumbai. IBEX is India’s most comprehensive trade fair and conference on banking technology, equipment and services. IBEX India caters to the technological needs of the banking sector and banking services sector, to make it customer friendly and also supports the banks’ need to implement Governments’ latest programmes and projects. The event was held in BKC, Mumbai from 19th to 21st January 2017. BuildTrack had set up a booth (D# 414) which displayed the Infrastructure Management Software technology which can help the banks manage multiple distributed facilities and assets in a highly efficient manner. Also, the Control and Monitoring technologies were on display which can create greater energy efficiency, safety and security across all branch/office locations of the enterprise. BuildTrack is a leader in Infrastructure Management Software and Systems for banks and financial institutions. The banking solutions that we offer include: Disaster Management, Energy Cost Reduction, Energy Management, Asset Management, Lease and Property Management, Seating Utilization Management. To know more about our banking technologies and offerings, please visit our page https://www.buildtrack.in/enterprise-solutions .